“Call Joe, he’ll know how to get it done!” Some people seem to know just about everything. Not only do they know the tools and processes needed to get the work done, but, perhaps most importantly, they seem to know exactly who and how to ask to get tasks done. Ever wonder how those people who always seem to be “in the know” do it? The answer is: organizational acumen! What is organizational acumen anyways? For me, it sums up with having the knowledge of how things work within your organization. That means understanding the systems, people, structures and processes that work together to make the whole. It’s knowledge that is built up over time across the breadth of the organization. Why is it so important? In large organizations especially, work can happen in departmental silos with very little connection to other areas of the business. Many managers and employees will focus on becoming the expert in their specific domain – and have great “departmental acumen”. But the larger the organization, the more potential there for process restrictions, unknown implications, untapped resources and large lag times to get things done. In today’s world, time can be the biggest resource gap with increasing expectations for immediate turn around times and service. When you understand the systems, people, structures and processes and how they work together, you increase your capability to not only get things done (faster), but also to add value by connecting dots others have missed. You can find more opportunities to collaborate and leverage resources outside your department. And with increased cross-organizational collaboration comes increased innovation. 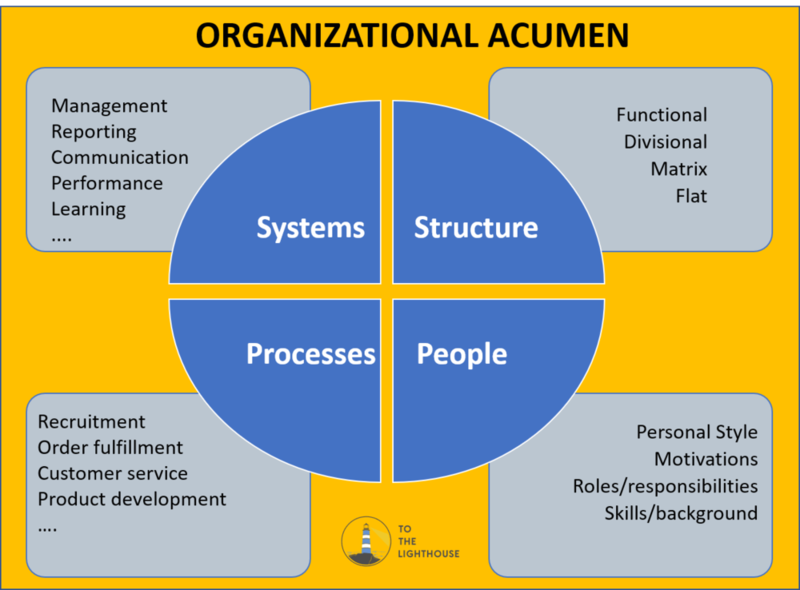 So how do you cultivate organizational acumen? We’re going to walk through each of the areas of organizational acumen and discuss how to gain knowledge about them. Understand how your organization is structured. The organizational structure governs hierarchy and reporting. It also determines decision making and communication flow. There are four types of organizational structures. You can best understand your organization’s structure by looking at the company’s organization chart. You should know the functions and divisions as well as understand how your department fits into the larger organization. · Functional – This is the most traditional structure for large organizations. The different functions of the organization define the structure – Human Resources, Sales, Marketing, Research, Finance, Operations are a few common examples of key functions. Horizonal communications are limited and much of work goes on within the vertical, functional hierarchy. · Divisional – Instead of using function to organize, these companies use divisions to create cross functional teams. Divisions can be created based on product lines, industries, target audience and/or geographies. While the functions communicate better in this model, the opportunities for cross- divisional collaboration can be limited. · Matrix - A matrix organization combines Functional and Divisional structures. Typically organized at the top as Functional, the functional teams are also members of Divisional teams. This greatly improves cross-divisional collaboration and eradicates certain silos. However, it’s a complex organization type to navigate within as employees tend to “report” to multiple leaders. · Flat – In start-ups and smaller organizations, a flat organization means teams are organized around projects. Although there is typically still a small leadership team, employees have much more autonomy. Communication flows more easily in a flat organization. However, it’s a model which is hard to scale and as companies grow, they generally shift to another operational structure. Systems are the combination of structure, responsibilities, tools and processes towards a specific goal. If you don’t understand the overall system, you will either flounder to get things done, or you’ll be reinventing the wheel each time and losing valuable time. Explore the different systems your organization has in place, starting first with the ones that directly impact your day to day work. What are the primary systems you should be aware of? There are many types of systems within large organizations. Here are just a few that you should pay attention to and make sure you understand. · Management system – what are the key objectives, measures of success, timelines, meeting structure and cadence and roles & responsibilities for your department. For the larger organization you should know the key objectives and measures of success, as well as the timelines which impact your department. · Communication system – where is key communication stored? How is it delivered? · Learning system – how is ongoing education managed in your organization? what systems can you access for continuous learning? · Reporting system – how are the core KPI’s documented, tracked and monitored? Who uses which systems? Understand how information gets rolled up and delivered to senior management. You may be using one system but your senior management may be using another one which provides a portal or dashboard from multiple systems and tools. · Performance system – how are objectives set? How are they tracked? What goes into performance evaluations? From a tools perspective, obviously you need to learn how to use the tools which are part of your day to day work. Go further and seek to understand how they are connected with other tools and systems. Who uses them besides your department? How are they used by others? What dependencies do others have on your work in the tools? What dependencies do you have on others work? Processes are simply the documented, repeatable step by step approach to get things done. They are the HOW things get done – and processes fit together to form the larger system. Generally, processes will define the tasks, the owners of those tasks, the order and timing of the tasks, and the tools which are used to do the work. Some examples of processes an organization may have are product development, order fulfillment, customer service, recruitment, performance and evaluation. Start building your Process acumen by understanding expected outcomes and deliverables within your department. Learn how each role contributes as well as the dependencies between team members. Other parts of the organization have processes which impact you too. Understanding the dependencies others have on your processes and your dependencies on theirs is a great way to start expanding your knowledge of processes outside your direct scope. Building relationships and getting to know people is an important part of organizational acumen. Every person has a unique set of skills and experience. It’s impossible to know what that is based on what job they are in. But once you learn more about people, you’ll know who to go to for what. You’ll know what to expect from individuals as well as the systems. · Roles & responsibilities – what do they do? How does that relate to what you do? · Skills and background – what skills do they have, what background do they have and what untapped skills or knowledge. · Personal style – get to know the individual and their preferences. Identify their communication style so you can adapt if communication gets stuck. Work more effectively with your manager by identifying their leadership style? · Motivations – Knowing what motivates people can be the key to unlocking better performance. Our brains crave reward – that’s a universal statement. But what actually resembles a “reward” for one person can be exactly the opposite for another. Besides your team and management, you’ll want to get to know your key stakeholders. These can be internal or external – don’t forget key partners and suppliers. Organizational acumen is built over time. Don’t wait to become the guru in your own department to be curious and build your organizational acumen for the larger picture. It will help you, and your organization, to be more effective.